It's commonplace nowadays, even outside old school circles, to sing the praises of Dave Trampier and Erol Otus, and rightly so. But there doesn't seem to be quite as much affection expressed for Dave Sutherland, which I think is a pity. Sutherland may have lacked the moodiness of Tramp or the weirdness of Otus, but he nevertheless had a unique and memorable style, one that continues to influence my conception of Dungeons & Dragons to this very day. Have not looked at this module since the late 70s, but I remember this particular picture like it was yesterday, it actually gets me excited about the "infinite possibilities" of D&D. Sadly I never played the module but the picture evidently is seared into my brain. I just got this one, too, and I was admiring that piece especially (nothing like a potential brawl with dozens of trolls to spark a cool illustration). I did notice that a piece in D1-2 wasn't in D1 - the Erol Otus illustration of the wyverns! DCS wasn't flashy like Tramp and Otus. But they did inject a certain amount of medieval realism into the player character depictions. Sutherland did a lot of great work. My favorite Sutherland pieces are in Legions of the Petal Throne. Always preferred him to Erol Otus. It was this self realization that made his move towards drawing and illustrating maps for TSR much easier. Sutherland felt, according to his sister, that for as popular and iconic as some of his most widely known illustrations were it was his later work on the maps for Ravenloft that were among his most polished and accomplished work. His tombstone, at the Fort Snelling National Cemetary, bears a simple inscription that also speaks to his love of maps: "God needed a cartographer". Thank you for sharing that story; it's both delightful and sad at the same time. I, for one, will always remember the man as an artist. Most of the pieces I remember most from the early days of D&D are his. James, I (mostly) thought of him as an artist as well until the funeral. When I think of golden age illustrations it is always his work that comes to mind. The next time I'm over at Fort Snelling I'll take a picture of his marker. A couple of months ago my son's Cub Scout Pack was cleaning the cemetary and his den actually "worked" the section where DCS is buried. That is an epitaph to be proud of! He had some technical limitations, true, but his illustrations are evocative of the early days. I was tickled when he did a few illustrations for an adventure in Dungeon Magazine in the early 1990s ... very old school, even then. Others already mentioned his technical limitations. As a young fellow in the early 80's I think I could not see enough past those limitations, as if D&D "settled" for him as an artist. Regardless, he still had his brilliant moments, even if only as one little item in a larger work. But, DCS still made his way into my favorites. I think something else also endeared him to me; I feel his "eye" was that of a player. He rendered the game of D&D into art, rather than creating pure works of fantasy. His work shows unique heart and character, attributes I was more able to value as I got older. I may be misremembering this, but he was the one who did the small party adventuring (in little installments) that ran through the 1st ed. DMG, yes? I think I once statted those characters out. I think they compose some subconscious ur-party in my D&D forelobes. Indeed he was! That's always been one of my favorite bits of D&D artwork -- by DCS or anyone. As an illustrator, DCS was a great cartographer. Enough said. Great "still fightin" severed troll arm and head on the guy in the forefront! 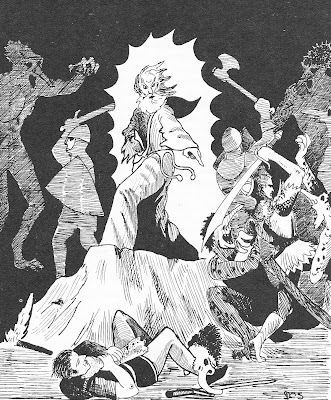 His work is the heart and soul D&D in the 70s, particularly with respect to his depictions of adventuring parties. That's a really great insight. There certainly are a great many memorable adventuring parties in DCS's illustrations, aren't there? I think that what's most interesting to me is that, though as many have noted his technical chops were perhaps not on par with the likes of Trampier or Otus, his subject matter was always, always perfect. "A Paladin in Hell" is well-remembered not because of his line work or whatever, but because the image of a paladin fighting devils in the Nine Hells is a highly memorable one. This picture in D1 is not so much a fine art piece with technically perfect shading or the like, but it is a scene that one could easily imagine occurring in a real, at-the-table game. One thing DSC really did well( maybe even better then any of his peers) was how he display a real grittiness to combat. One example is is sea lion vs s shark pic were instead of having a sea lion facing off against a shark like other artists might do, he instead had the sea lion biting deep into a shark with another sea lion close by ready to join in, or the harpies ambush where their swooping in ready to tear the party into pieces--one's even got a hand axe! One of the best as far as I'm concerned. I'm a Bill Willingham fan, personally. Love his stuff too, especially his drow. I think one of my favourite things about both Tramp and DCS is the use of action. I get really tired of gaming art where it looks like the subject is posing and much prefer a scene full of activity. There's a picture in Rappan Athuk 3 (3.0 version) that has a scene like this - adventuring group fighting trolls and being swarmed by severed body parts. I wondered if that artist (Brian LeBlanc) was invoking this picture. Necromancer was all about that "Old School Style" after all. I tend to prefer the work of Tramp, Otus and others, but I still even prefer DCS' illustrations to the digital paintings in modern RPG books. I can't seem to figure out why that is. I was born in '85 and didn't even start tabletop gaming until the early 2000s - I have no nostalgic connection to the artwork save for a 1E Monster Manual I owned as a kid. The rest of you seem to feel similarly - why? Why do we like the old art better than the new? Are we just snobs, or...? It's good to have great technical chops. Seriously, it is. It makes a lot of things possible. But whether you're a singer or play an instrument or are an artist, chops won't do anything great if you don't have a brain with the power and magic to use the abilities you've got with the proper oomph. Sutherland had that oomph, even if he didn't always have the chops to fully bring it forth. A lot of artists today have better chops, or better ways to hide their lack; but their work has no power, nothing to stick in your heart or your memory. It's as bland as toilet paper and a waste of time. What I want from art is something with the power to make it worth looking at. Chops make oomph better, but they can't put it there. The wizard looks like he's doing the "Finger Point" dance from Saturday Night Fever. ZAP! ZAP! ZAP! ZAP! Stayin' alive! Stayin' alive! The way the light hits his robes it looks like he might even be wearing white bellbottoms, lol. The Articles of Dragon: "Mutant Manual"
"Fit Only for the Trashcan"